A rather intriguing lot will be up for auction at Christie's later this month. An 1872 skull ballot box from Yale University's mysterious Skull and Bones society will be sold as part of Christie's New York's Important American Furniture, Folk Art, Silver & Chinese Export sale on January 22. The skull has a hinge on top and is surrounded by charred-looking crossbones one inscribed with the word Thor. 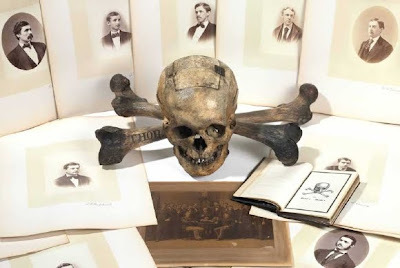 Skull and Bones was founded in 1832 and has been the subject of many works of history and fiction (I found Secrets of the Tomb to be particularly riveting). Many notable Yalies including both Bush presidents have been members. The lot includes a black book with names and photographs of earlier members and is estimated at $10,000 to $20,000.